By the start of next season, the Kildare native would have spent enough time living in west Wales to qualify on residency if he'd stayed on. As well as a favourable pay packet, the chance to line out for Wales was on the table. Instead, he took the pay cut and chased his childhood dream of donning the green jersey. Even before he'd linked up with Munster, Beirne had played an important role in securing the series win on tour to Australia. As he returned home from Sydney he was entitled to reflect positively on his choice. Right now, he might be starting to think quite differently. All indications are that the 27-year-old will not feature against the Welsh this weekend, meaning the international season would have passed by with him only starting games against Italy and the United States. Beirne has been Munster's best player this season, a force of nature whose arrival, in conjunction to that of Joey Carbery, looks to have turned last season's semi-finalists into European title contenders. He has been the turnover king of the Champions Cup, leading the charts with 13 in six games, but he's no one-trick pony; leading the Munster lineout, carrying and tackling with real menace and playing a role in an increasingly impressive scrum. His provincial coach Johann van Graan has spoken at length about the free role he has given Beirne within the structure and the player has responded with a number of barn-storming displays. There is no libero in Joe Schmidt's Irish system, however. Still, Schmidt included him in his initial Six Nations squad, but an untimely knee injury took him out of the equation for the first three games. 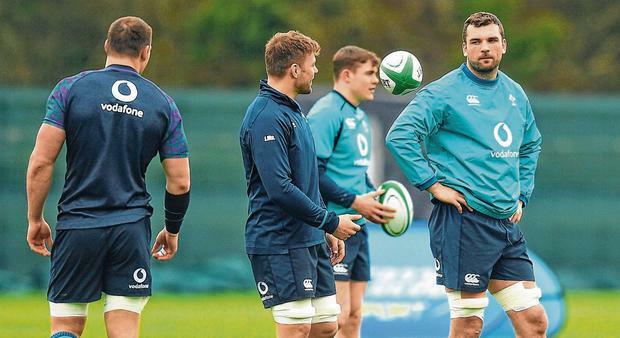 As the end of the tournament approaches, Schmidt has used James Ryan, Iain Henderson, Devin Toner, Ultan Dillane and Quinn Roux in the Championship but Beirne has watched on from afar. In total, 34 players have featured to date but the Munster star has not been one of them. With Ryan and Henderson starting, Dillane was preferred as a bench option against France last weekend and looks set to continue in the role again in Cardiff on Saturday. When explaining Beirne's omission, Schmidt said the Munster man was sore from training but didn't elaborate on a potential injury. Beirne covers two positions and his energy off the bench was a key part of the victory that secured the series in Australia, but right now he finds himself on the outside looking in. Over in Wales they're fully expecting the return of a player who earned huge respect during his 24 months in Llanelli and they won't be unhappy to see him omitted. Back in his native land fans and pundits alike are left scratching their heads at his absence. Yesterday, scrum coach Greg Feek was asked what Beirne might need to do to force his way into the equation. "There's that physical side of things. For a physical man like him, he hasn't played a hell of a lot," the former All Black said. "Getting through some work, some trainings, the high-intensity trainings and seeing how he comes through that. "These decisions aren't made lightly and, yes, his form has been really good. He's been in top form when he's played for Munster. "He played some cracking games but we have to make sure that we feel like they're ready. "If he was carrying something, you want to make sure that that's all clear, that he gets a good hit under his belt and then he can perform at the level required. "There's a lot of science that goes into that as well, we have everything tracked and data-ed (sic), so we work closely with our GPS man Pearse (O'Doherty), and Jason (Cowman) and that, the medics, than our own views around are they staying in the system, are they working continuously, not backing off. "He's been asked and all the guys are pushed really hard to make sure that we train as we play. That's really important to prepare yourself for a Test match and I think for Tadhg that's been a good lesson." So, the overriding message is that Beirne needs to pick up his training-ground performance to complement his front-of-house work with Munster. If, as expected, he misses out on selection this week he'll go back to the province on a mission to prove himself to the main man, but it will be in the pre-World Cup camp where he'll really need to prove his mettle behind the giant green screens at Ireland's training base.